There might only be one combination of coaches that would be able to build a matchless bond like football and basketball coaches at the collegiate level. Consider this, NBA and NFL coaches do not always share the same mascot, facilities, rivalries, or even fans. No national championships are taken more seriously than football and basketball. 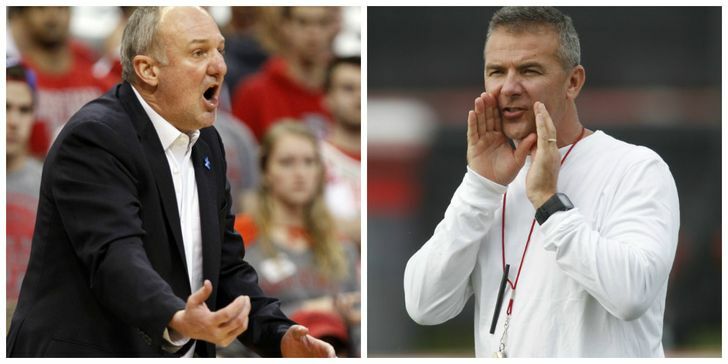 To no surprise, some of the highest paid coaches in NCAA athletics hail from the Big 10 conference. Football and basketball are two of the most revenue generating sports in any school’s athletic department, but this conference found a way to specialize in them. In regards to football, according to the Big 10 network, four of the 10 highest paid coaches belong to the Big 10. And in a 2015 study by USA Today, the same applies to basketball; four out of 10 make that list too. All in all, these coaches have a competitive job that has been able to build a unique relationship with another head coach of a completely different sport. Mark Dantonio, the second highest paid coach in all of college football, has a very close relationship with the fifth highest paid coach in college basketball, Tom Izzo. 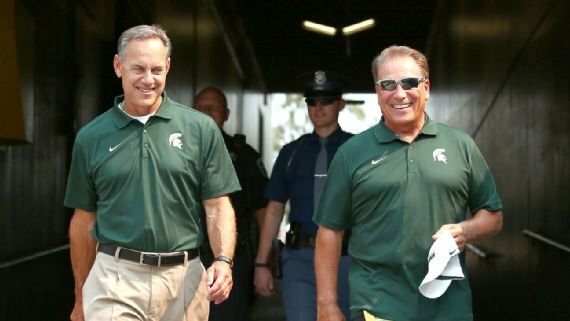 East Lansing, Michigan, home of the Spartans, is where these two coaches can be found attending one another’s games. Since his Michigan State career began, Dantonio has coached his way into one of the most successful programs in school history. He holds the record for most bowl games, and conference titles out of all MSU football coaches, and two time winner of Big Ten Coach of the Year. Tom Izzo is currently waiting on the final results as he is one of the 14 finalists for the Naismith Hall of Fame. Four-time Big Ten tournament champions, seven-time Big Ten regular season champions, seven Final Four appearances, and one national championship, may have placed him in the running to be a finalist. A short story on ESPN illuminates their “unique relationship”, driven by each other to coach their teams to victory. Fran Mccaffery, is in the midst of his sixth season with the Iowa Hawkeyes, after years at smaller Division 1 schools. After his first year, in 2010, has continued to finish with winning seasons and enter the NCAA tournament, however, he has been less than successful in making it past the third round. This current season is very hopeful for McCafferey. The team took down number one-ranked Michigan State in East Lansing in early January, has only lost six games, and is currently ranked number one in the Big 10 conference. 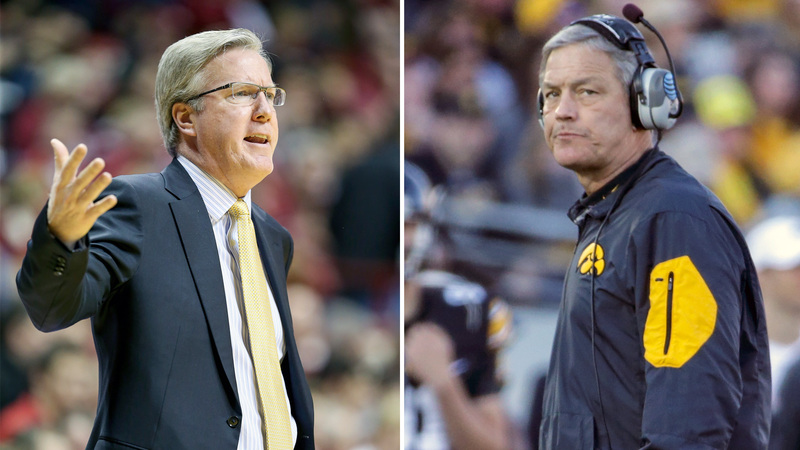 Kirk Ferentz shares the Univeristy of Iowa campus with Mccafferey as head coach of the school’s fooball team. In 2002, he not only won his first Big 10 conference championship, he was also honored with Big 10 coach of the year and AP coach of the year. This past 2015 season, Ferentz saw an undefeated regular season with 12 wins, honored with conference coach of the year, yet again, and finally saw a loss in the conference championship to Michigan State. This was said to be one of the most successful seasons of the school’s football program ever. The two coaches have a close relationship that allows them to bond as coaches. McCaffery explained that after tough losses or big wins, the two will send each other notes to further build their camaraderie. 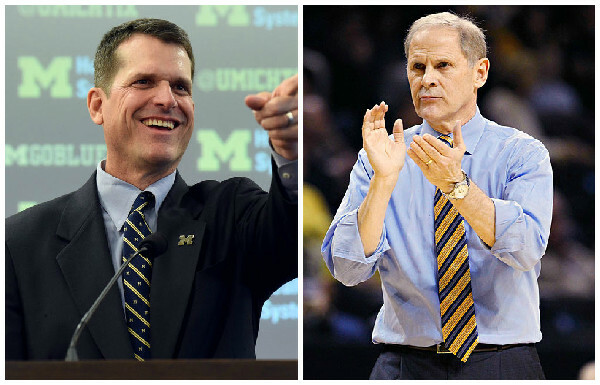 Another Michigan powerhouse lies in Ann Arbor, home to John Beilein and Jim Harbaugh. Halftime at a Michigan basketball game in 2014, Jim Harbaugh was introduced as the incoming head coach for the Michigan football program. His single year at Michigan was a real triumph, as he brought them back into the top 25 for the first time in two years. Harbaugh only lost three games and won his very first bowl game with Michigan against the Florida Gators in the Citrus Bowl. Although John Beilein started coaching the Wolverines in 2007, his real success came in more recent years. In the 2011-12 season the team was named champion of regular season conference play for the first time ever. The following year, the team went all the way to the National Championship and came up short to top-seeded Louisville. Beilein actually visitd a practice of Harbaugh’s and praised his ability to teach players and the other coaches. These four schools have some of the most impressive programs in Big 10 history. It seems like all of these coaches have a link, coaching in a Big 10 atmostphere is not something every coach understands. These schools live, eat, and breath college basketball and football. So much tradition lies within the roots of these schools, partly because the Big 10 is the oldest Division I conference, but the fact that it is taken so seriously also plays a role. The tie is so tightly knit between two coaches because they know that all of practices, plays, games, team meetings, are all in the effort to accomplish another victory.